This set of adorable organic cotton veggies is perfect for your little sweet pea. Perfect for your little sweet pea, this set of adorable organic cotton veggies looks straight from the farmer's market. Made and stuffed with 100% organic Egyptian cotton, these veggies are ideal for all ages and will encourage your child to develop a positive attitude towards vegetables. Super-soft, easy to grip and washable, babies can chew on the veggies while teething, while older children can use them for imaginative play. The natural wood veggie crate holds four veggies, included: tomato, carrot, mushroom and green pea. Sold as a set. Made in Egypt. Uses low impact dyes and hand picked 100% organic Egyptian cotton. Click here to read about creator Janice Masoud and the Sekem organic cotton farm and see the matching fruit basket. Prior to founding her company in 1997, president Janice Masoud worked as an apparel designer for 14 years. When searching for organic products for her young children, who were experiencing allergic reactions to conventionally manufactured products, she discovered organic Egyptian cotton at the Sekem Initiative Farms in Egypt, and immediately started working with the farm on a line for the U.S. market. Back then, organic cotton was not readily available, so Janice thought about starting a company to make organic baby clothes that could benefit her own children as well as others. The Sekem Farm provides a worldwide model community for biodynamic agriculture and a workplace that is fully supportive of its workers, from educational programs to health care. From the cottonseed to the spinning and weaving of yarn to the sewing process, every manufacturing step is completely toxin free. All Sekem farms are "Demeter" and COAE (Center of Organic Agric. in Egypt) Certified. Demeter certification is the highest certification in the world, ensuring that the entire process, from growing the cotton, spinning, weaving, dying all the way to sewing the garment is certified. All Under the Nile hangtags feature the Demeter logo. Teethers: Machine wash in cold water and machine dry. Teethers for all ages; crate is not a toy, not for children under 3, and is intended for storage purposes only. Great for teething and introducing babies to healthy foods. Given as a gift to a baby . Definite must for those little gums! Bought these for my future granddaughter. I know these will be easy for her to grab and no sharp edges to irritate gums.. 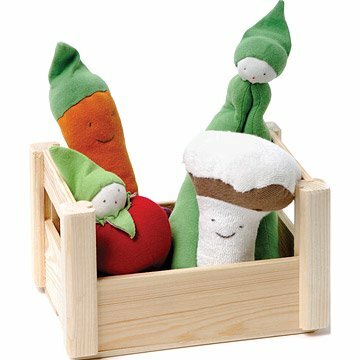 These veggie characters and their cute little wooden cradle were a perfect selection for a nursery. I wanted to give a gift that would grow with the little one and these characters will go from super cute nursery decor to function. In addition, the cradle they sit in is so handy for mom grab one and there is a little friend to snuggle for baby's stroller or car ride. I bought these teethers for my nephew and he loved them, especially the green bean. They were durable and easy for my sister to clean so my second nephew also enjoyed them once he came along! I just bought another set for a friend who is about to have her first child. I hope her son loves them too! Soft veggies are great texture for teething. 4 month Baby is obsessed with them but especially the pea pods! I would definitely buy this product again in the future. The item was for a vegan Mother to be .. so this was perfect ! She loved it ! Super soft and easy to grip - a present for our 4 month old niece. She enjoyed the various colors and they were easy to grab (and chew). I will be giving this to my wife as part of a larger gift. She loves wooden toys for our little one, and should enjoy having something else for him to chomp on then her hair.